© Mohamed Azakir Syrian refugees prepare to return to Syria from the Lebanese border town of Arsal, Lebanon, on June 28, 2018. A barrage of airstrikes hit rebel-held areas in southwestern Syria on Thursday, killing at least 17 civilians hiding in an underground shelter as government forces pressed their offensive to reclaim a region that was until recently part of a U.S.-backed and negotiated truce. The strategic southwestern corner of Syria extends from the border with Jordan in the south to the western frontier with the Israeli-occupied Golan Heights. It also lies south of the capital, Damascus, and has been under a so-called de-escalation agreement reached between Russia, the main government ally, the United States and Jordan in July last year. The truce unraveled in recent weeks, triggering a wave of displacement within the southwestern Daraa province and along the border with Jordan. 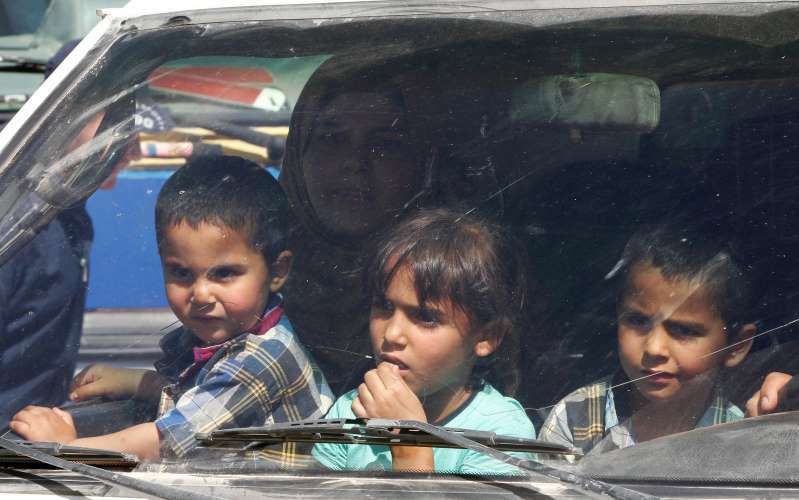 Aid groups have urged Jordan to allow Syrians fleeing the violence into the country. The Britain-based Observatory for Human Rights described Thursday's airstrike in the town of al-Musayfrah in eastern Daraa as the worst violence since the government offensive began in the area on June 19. The Syrian government troops are seeking to dislodge rebels who have been in the area for years, and gain control of the commercial border crossing with Jordan. The Observatory said the airstrike was part of a barrage of missiles that hit the area as government troops head toward southern Daraa and the border. In recent days, government forces have gained new ground from rebels, bisecting rebel-held territories in Daraa's east and west and severing their supply lines. The Syrian Civil Defense, a team of first responders, said more than 150 airstrikes targeted 12 towns and villages in eastern and western Daraa since dawn, setting off a new wave of displacement. Up until Tuesday, the United Nations had estimated that nearly 50,000 people are on the move in Daraa, fleeing the violence, most of them heading to villages near the Jordanian border. Jordan says it will keep its borders closed and urged the U.N. to provide security for the Syrians within their country. Thousands of other displaced have headed to the frontier with the Golan Heights. Israel has not commented on the offensive or the displacement. The Observatory said at least five children were among the 17 killed in the al-Musayfrah strike. An activist with the opposition-operated Horan Free Media, who goes by the name Abu Mahmoud Hournai, said the rescuers were still pulling bodies from the underground shelter by early afternoon. He put the death toll at 20, saying women and children were among the casualties. "They are still pulling people from under the rubble," Hourani said. "The situation on the ground is disastrous." The Observatory said at least 46 civilians, including 15 children, have been killed since the offensive began, including the victims of Thursday's airstrike. The international aid organization CARE said humanitarian workers in the south are struggling to deliver basic needs to the population. One aid worker in an organization supported by CARE was killed in shelling on Tuesday while on duty. "Civilians are paying the price of another military offensive. What we have seen in Aleppo, northern rural Homs, and (Damascus' suburb of eastern) Ghouta, is happening now in the south, where cities and towns are bombed daily, people are being uprooted and lack basic human necessities, such as water and shelter," said Wouter Schapp, CARE's Syria country director.